At the beginning of the Movement Phase: 10, + 1 for Malta Status hit early in the M. Phase = 11 at the beginning of the Axis Naval Movement Step and at the EOT. 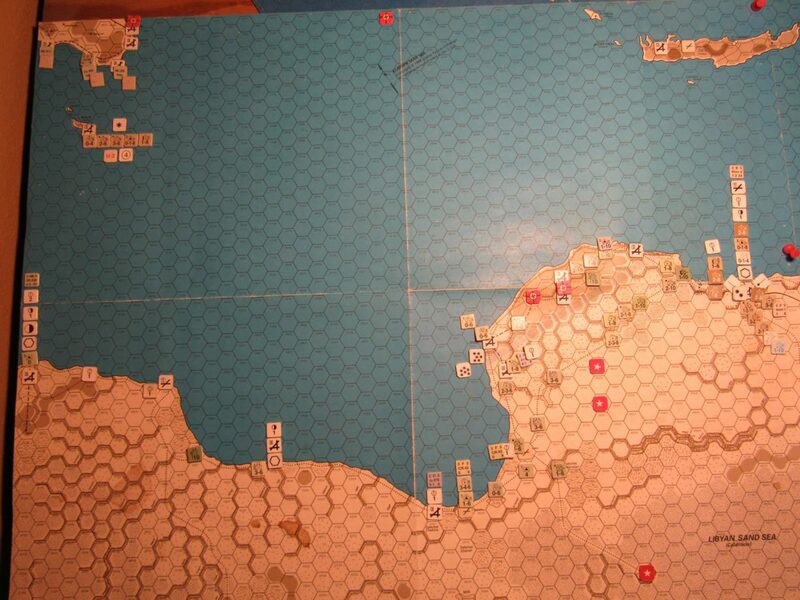 Both these turn reinforcements are successfully sea transported from the Mainland Europe off-map holding box to Homs; then they both admin moved 12 hexes along the coast road to hex 18A:1226—Buerat el Husn; later they both exploited to 2227. Began at 18A:3223; regular moved 10 hexes from there to 3717, gaining road hex control, using “northern” route through Jebel Akhbar rough terrain zone. It captured Barce hex and the 3-cap permanent airfield at 18A:3617. Per the 1941 ME/ER-II/Crete Scenario draft rules, the pro-Axis Iraqi Coup “automatically” occurs in the Apr I 41 Axis Initial Phase. Per WW Rule 38J4-[Iraqi] Coup, the Axis player may not move the Iraqi forces this turn. In playing the WW 1941 ME/ER-II/Crete Scenario it is currently recommended to use WW Optional Rule 38J7-Iraqi Armor, giving the Iraqi lt arm X neutral AECA/AECD instead of full AECA/half AECD. WW Optional Rule 39E4-Fawzi al Qawukji action die roll: 5; Fawzi is under control of the Axis player for the player turn. 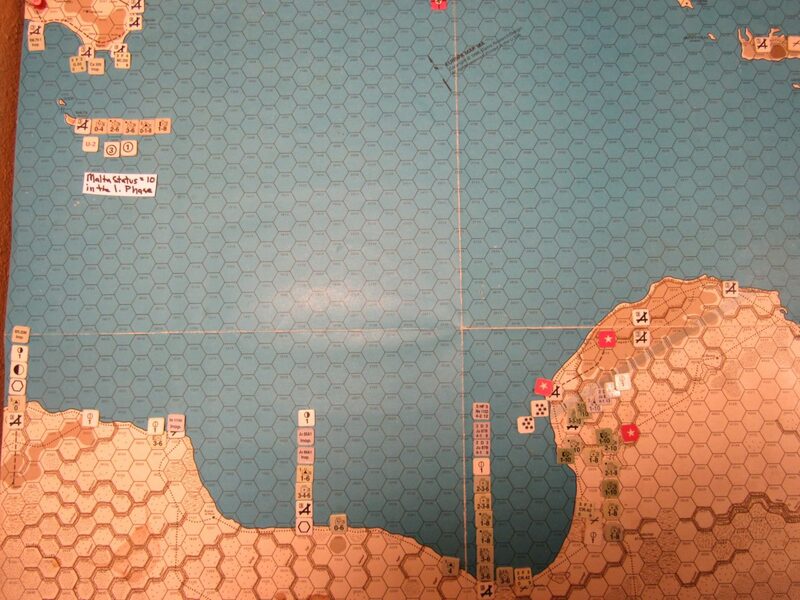 The Axis player keeps the Fawzi unit in Combat Mode and in the M. Phase regular moves it 8 hexes SW down the road from 21A:4717 (H-1 Pump Station) to the Rutbah hex (21A:5023), where it ends its move. Per the 1941 ME/ER-II/Crete Scenario draft OB the Axis may try to gain entry into the Levant starting in the Initial Phase of this Axis turn. This coincides with the bullet text indicated in the WitD Axis OB for the Apr I 41 Axis turn, which is used as a basis for the 1941 ME/ER-II/Crete Axis OB. This is certainly because in both our 1941 WW ME-based Scenario and in the older WitD Rules/Axis OB it is explicit that on the Apr I 41 Axis turn the “historical situation” occurs in the Balkans, eg., clear weather, German intervention, and thus Operations 25 and Marita. 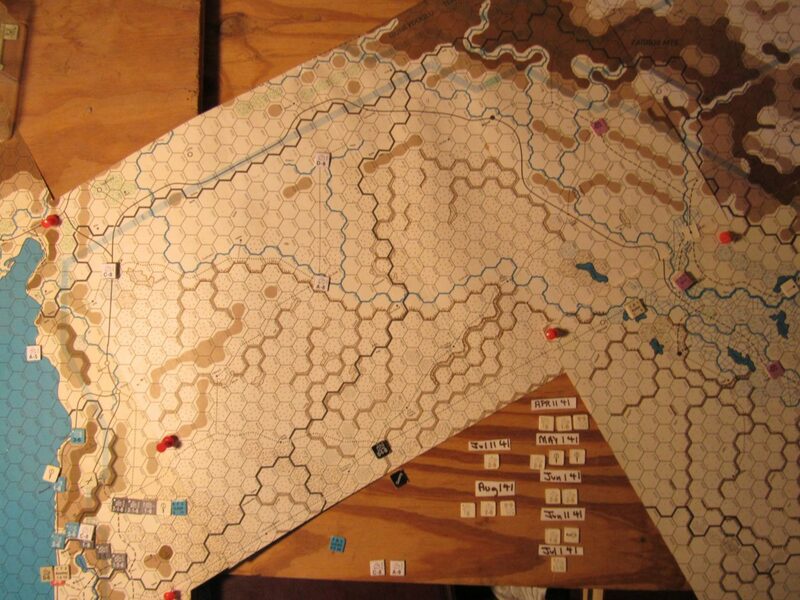 But this turn in the EA reported war game the Axis player opts not to roll the dice using the Vichy Levant Table, found on WW Game Play Chart 8. More below on why. Per Rule 38V3a-Axis Privileges [in the Levant] “Germany intervenes in the Balkans…[on the] Apr I 41 [game turn] if the Southeast Command is not under Axis control….” On this turn in the standard WW ME Scenario the Axis player may begin using the Vichy Levant Table found of WW Game Play Chart 8 and try to gain special privileges in the Levant, if he has not violated the neutrality of any Vichy region. Per Optional Rule 38J6-Axis Intervention in Iraq we see that “Athenai is considered to be Axis-owned … on … [the] Apr II 41 [Axis turn, presumably in the Movement Phase].” Therefore in our Scenario, per (new) Optional Rule 23J-Axis Air Ops from Aegean Islands (found in the Wavell’s War Errata-28 October 2005) Axis air units based on the Axis air fields at Scarpanto or Rodi are released from the supply restrictions of Rule 23I-Out-of-Supply Airbases beginning on the May I 41 Axis turn. Assuming the use of Optional Rule 38J6 in the EA reported scenario, we use the Optional Axis Near East Forces Axis OB found on pp. 27-28 of the WW OB booklet. 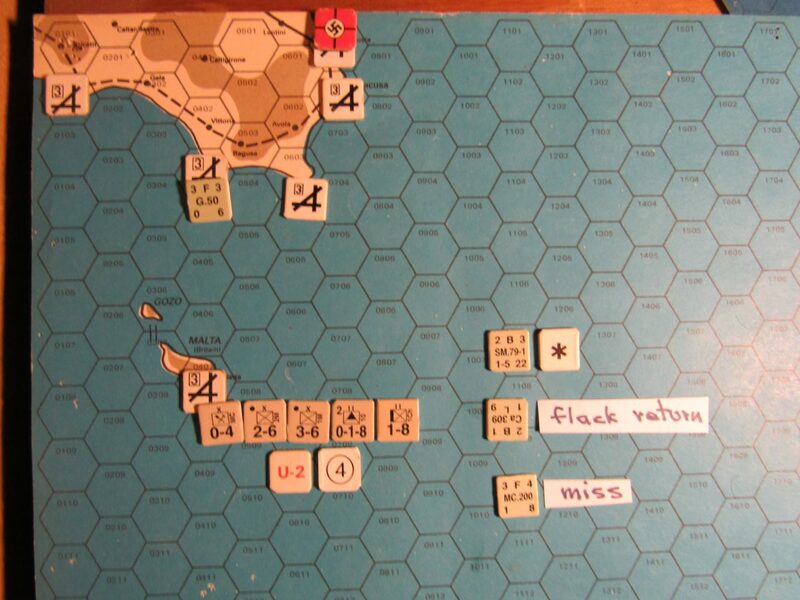 We see that very likely in our 1941 ME/ER-II/Crete Scenario war game, Coup Turn 3 = the May I 41 Axis turn, Coup Turn 4 = the May II Axis turn, Coup Turn 6 = the June II Axis turn, and so on. 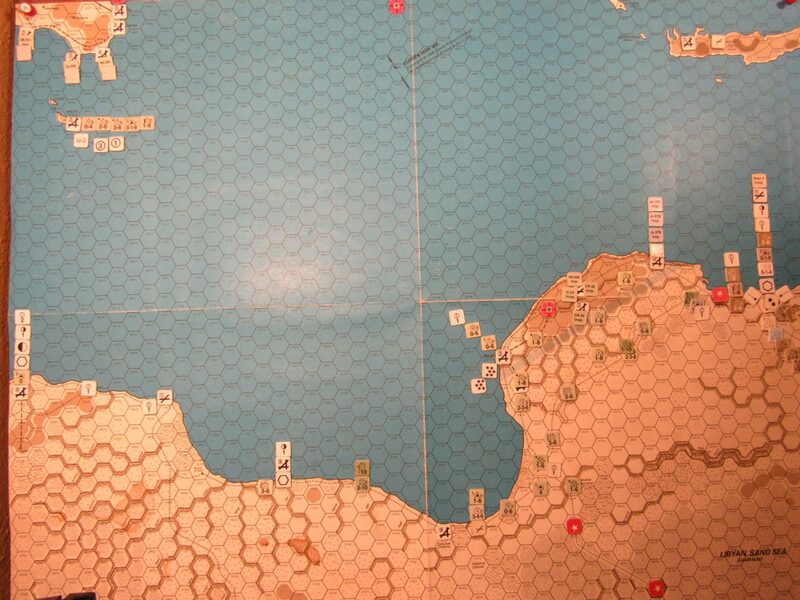 Per the 1941 ME/ER-II/Crete Scenario draft Rules and OBs, the added-on Assault on Crete segment definitely begins on the May II 41 Allied turn, using essentially the forces found in the Axis and Allied OBs for the WW Assault of Crete Scenario (along with some additions) found in the WW OB booklet. The Assault on Crete segment continues until the Axis player ceases operations in the Balkans per, Rule 3E5. To be sure, in our Scenario where we have an Axis Assault on Crete segment, WW Rule 3E5b-Voluntary Cessation of Operations in the Balkans says that “the Axis player may cease operations in the Balkans at the start of any Axis initial phase in which … no South Aegean Island has both Axis and Allied units present.” But more below on this. Finally, since our Scenario is based on the WW Middle East Campaign (Rule 41B5), it is possible in some circumstances to implement Rule 38T2-[Turkish] Participation (Limited Intervention). Axis Intervention in Iraq may occur only after the Iraqi Coup, which in the new Scenario “automatically” occurs on the Apr I 41 Axis turn Initial Phase. However, the Axis player must always announce the Axis intervention in Iraq only in conjunction with an Axis pressure of Vichy France to grant Axis Privileges in the Levant (see Rule 38V3), which per the WW Master Sequence of Play Summary occurs prior to the mandatory check for an Iraqi coup. Therefore (in the new Scenario) the earliest the Axis player may declare an Axis intervention in Iraq, per Optional Rule 38J6, is in the Apr II 41 Axis Initial Phase. Once the Optional Rule 38J6 Axis intervention in Iraq is announced in the Axis Initial Phase, the optional Near East Axis forces are activated, and the first are available on Iraqi Coup Turn 3: in the May I 41 Axis Initial Phase, at the earliest. The purpose of this admittedly technical procedural stipulation is to make absolutely sure the Levant Status proviso is in effect, allowing the Allied player to subsequently invade the Levant, in the case of Axis intervention in Iraq exclusively per Optional Rule 38J6. Per the same Levant Status proviso the Levant is also accordingly made a “part of the Allied Middle East Command”, which is good for the Allied player. 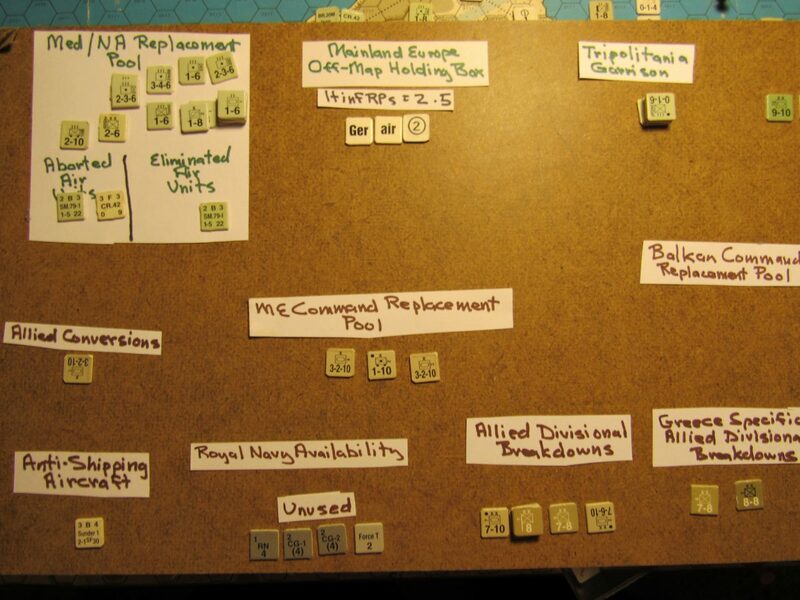 Now, in our EA game reporting situation, when the Axis player will likely declare for Optional Rule 38J6-Axis Intervention in Iraq in the Apr II 41 Axis Initial Phase, he may or may not do this along with a dice roll on the Vichy Levant Table, which could certainly stimulate additional Axis force availability in the Near East coming from the Axis Med/NA Command’s forces found in the WitD Axis OB booklet. There are good intentions here that eventually all these various procedural nuances broached here will be integrated into a comprehensive, focused, streamlined, and updated revision of Rule 38V3-Axis Privileges [in the Levant] and Optional Rule 38J6-Axis Intervention in Iraq, to be done for the new Scenario. 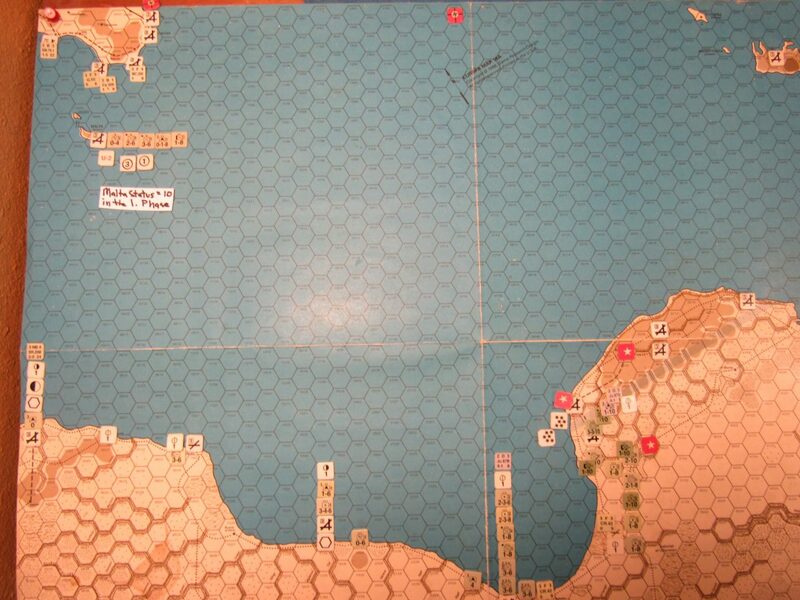 Per the 1941 ME/ER-II/Crete Scenario’s Axis draft OB, beginning on Iraqi Coup Turn 4: in the May II 41 Axis Initial Phase, at the standard port/3-cap permanent air field hex of Rodi (20A:2230), the Axis player receives as a reinforcement one gsp, along with the Ju 52 T type air unit reinforcement called for in the Optional Axis Near East Forces Axis OB found in the WW OB booklet. For now it is assumed this gsp was successfully sea transported to Rodi at the beginning of the Movement Phase, and therefore was generated in the same May II 41 Axis Initial Phase. Then the Axis player continues to receive one gsp at the port hex of Rodi in each following Axis initial phase in the same manner until the Axis either ceases operations in the Balkans per Rule 3E5b, thereby kicking in Rule 12C2a, or the Axis player voluntarily withdraws from the Near East the Axis intervention in Iraq air units, per Optional Rule 38J6, whichever comes first. For those who wish a source for the possibility of a single gsp at Rodi at the admittedly relatively early date of the May II 41 Axis Initial Phase, see The Mediterranean and the Middle East, Vol. 2, “The Germans Come to the Help of their Ally” (1941) by Playfair; 1956; p. 196. Finally, in the new 1941 ME/ER-II/Crete Scenario draft Rules, when and if we get to the May II 41 game turn in the EA postings, at Rule 3E5b-Voluntary Cessation of Operations in the Balkans, the first sentence may be amended to read “…the Axis player may cease operations in the Balkans at the start of any Axis initial phase … [when] … no South Aegean Island [eg., on Crete, in our case] has both Axis and British units present.” Here “British” units has been substituted for “Allied” units; this is “British” in terms of British Empire national forces per Rule 3b2-Allied [Side]. This means that if there are still only one or more of the three Greek static IIIs alone remaining on Crete, it is assumed under the circumstances they have surrendered in the meantime, seeing that the original British Creteforce is no more. Comments, constructive criticisms, and new ideas are of course welcome; that is the point of all the above. 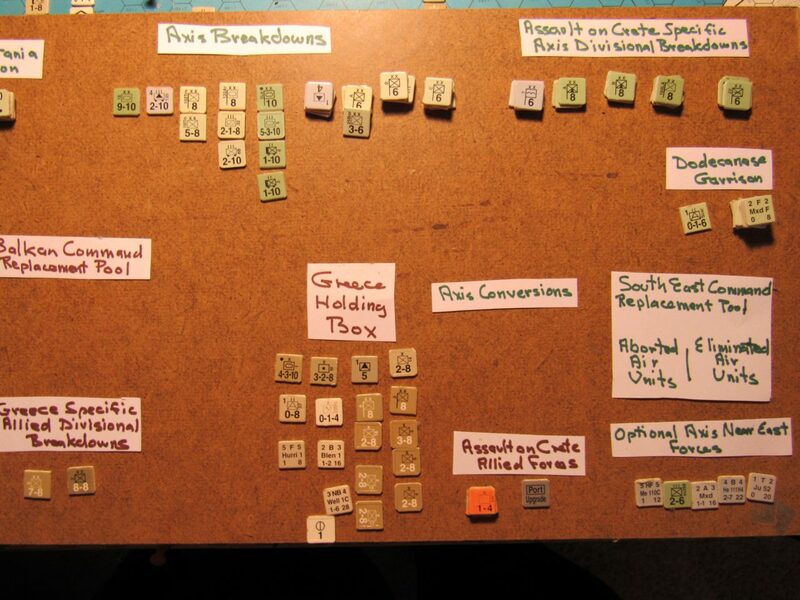 In a big Europa war game project like the 1941 ME/ER-II/Crete Scenario one person can’t do everything and come up with a superior product; but he can start it. Per the WW ME/ER-II/Crete Scenario rules the Iraqi coup automatically occurs in the Apr I 41 Axis Initial Phase, after the supply determination segment. Axis Replacement Point inventory at end of the Apr I 41 Axis initial phase: German: 2 ARPs, Italian: 2.5 inf RPs. The Axis spends 1 It inf RP to rebuild 0-6 Cons III 10A; the Axis gets .5 It inf RPs as reinf. The Axis player receives two steps of attack supply as turn reinforcements. In the M. Phase these two steps of attack supply are successfully sea transported across the central Mediterranean to Tripoli, in Libya, where they remain at the end of the Axis turn. Axis uses one Med/NA NTP to sea transport 0-6 Cons III 10A to clear terrain coast hex 18A:3122, adjacent to Bengasi. Here the unit makes an amphibious landing without disruption. In this same coastal hex the Axis also amphibious lands the 0-6 Lt AA II 36 turn reinforcement, using Axis turn reinf sea transport. This ground unit also lands without disruption. This turn in the Initial Phase the big LW air unit withdrawals are done for the giant German intervention into the off-map Balkans. So imagine this: a combination of the 1941 ME/ER-II Scenario with the WW Marita-Merkur (M-M) Scenario would make for the creation of a giant rip-snorter 1941 ME/ER-II/M-M Scenario. Whew! Meanwhile, back on our game board, we see that the Axis player has made some strategic choices with the now reduced Axis air units. 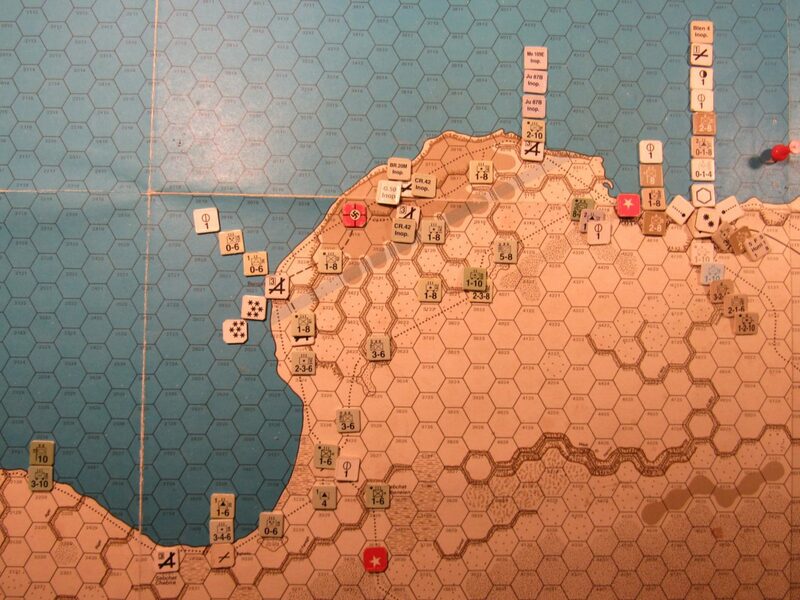 This turn the Axis has kept the Italian BR 20M NB type and both remaining German LW Ju 87B D type air units in the Cyrenaica rather than positioning them on map 18A in order to do Malta Status air mission attacks the next Axis turn. Other Rommels might play this Europa turn differently, at least with the Axis air assets. What do you think? Also, what about the forward panzer spearhead at hex 18A:4318; is it too far forward and vulnerable, or is it a bit cautious? What would Rommel do?